Register Log In GB HOMEPAGE Forums ADVENTURE GAME DISCUSSIONS Kathy Rain is free for Amazon Prime members Feb 9 - Feb 13! If you subscribe to Amazon Prime, you also get a free subscription to Twitch Prime. 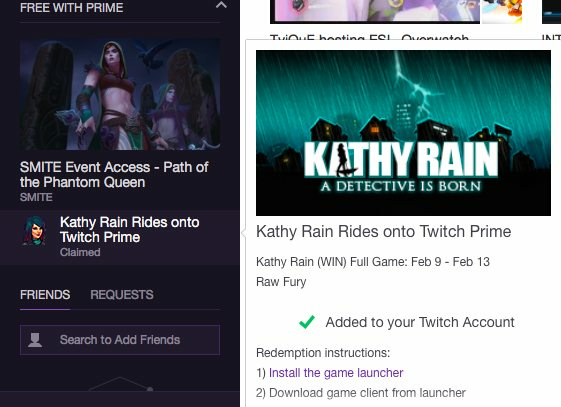 For the next 3 days, they are giving away Kathy Rain on Twitch Prime! You do have to install the Twitch Launcher. And click where it says "See loot"
On the left of the screen you'll see where you get the game for free, as shown in this screenshot. Thanks plswdth, just got it.